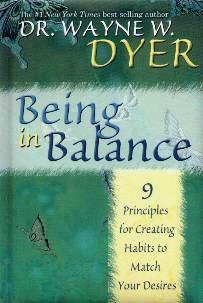 If you've never heard Dr. Wayne Dyer deliver his inspirational seminars, do yourself a favor and seek him out. His personal story of how he grew up will bring tears to your eyes. His love for his mother is achingly real. A true motivator. This new book of his is about how we have to align ourselves with everything around us, as does nature, and find a balance in our lives so that we can live our dreams. He says, "Your desire to be and live from greatness is an aspect of your spiritual energy. In order to create balance in this area of your life, you have to use energy of your thoughts to harmonize with what you desire". And, "Every thought that agrees that you're stuck is asking the Universe to send you even more of that glue to keep you stuck". These words struck a chord with me in that I get so down I feel totally hopeless and useless, instead of clearing my mind of silly thoughts and filling it with an encouraging and clearer mental outlook. The old sayings "the power of positive thinking" and "what you put out there will come back to you" come to mind. All this from the first chapter! There are eight more enlightening chapters to help us be the person we ultimately want to be. What could be better than that? The feel of this book is like no other - it begs to be held and read. Conclusion - Finding a balance is not as difficult as I thought - I needed this encouragement and direction.